As a whole, The United Group of Companies, Inc. cares for a wide range of people, events, and topics. We want to share the passion we have for our company by transforming that passion and using it to benefit others. The following are six examples of how United Group cares beyond the incoming revenue we generate. The list doesn’t end here, however, we are proud of what we support as a company and would like to highlight some of our favorites! United Group likes to support every cause we can. 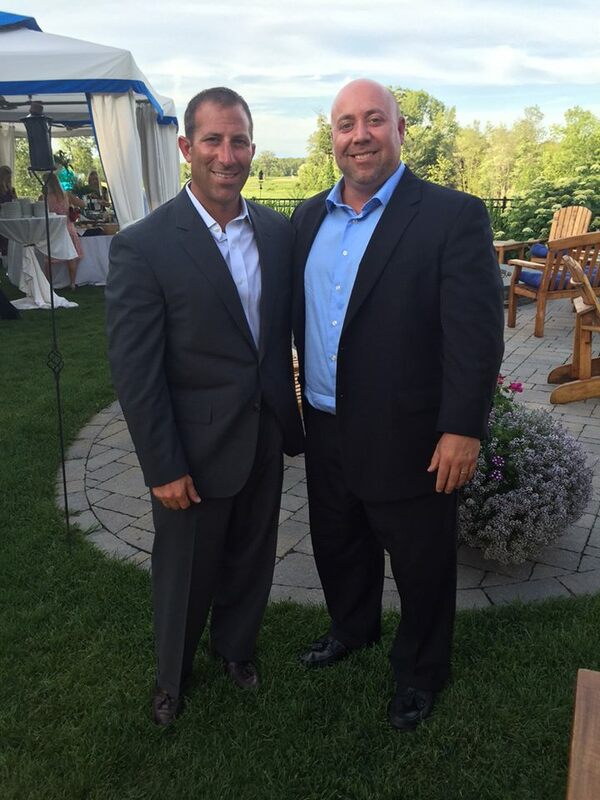 Recently, our COO Jeff Arnold and our Director of Business Development Tommy Uccellini took time to attend “Swingin’ Through the Years,” an event in support of The Father Peter Young Foundation at Saratoga National Golf Course on July 20. This foundation supports the homeless, people battling addiction, and reformed men and women with criminal records. We thank Tommy and Jeff for their attendance and representing United Group at such a meaningful event with an important cause! “Swingin’ Through the Years” is one of many events for a cause United Group has attended. We care just as much about future residents as we do our current ones. Some of our properties are in the midst of development and we already have residents who have signed leases! How do we keep in touch with these residents who have yet to move into their new community? Two of our properties that are currently under development are Sandalwood Village in Naples, FL and Glenmont Abbey Village in Glenmont, NY. United Group has created a monthly newsletter to keep these residents updated and in the loop! Topics featured in these newsletters range from construction progress to summertime pet safety tips. We want to educate our residents and keep them a part of the journey leading up to building completion. There is also a “meet your neighbors” section of the newsletter which allows recipients to begin “meeting” their future neighbors and friends – we want to keep the anticipation high for move-in day! United Group has over 35 years of experience in both the senior housing and student housing markets. What differentiates us from our competitors in these markets is our senior housing SUN® (Senior Umbrella Network) Program and student housing Live. Learn. Relax. Program. The SUN Program is our signature seven-prong model that provides an array of services and activities designed to foster and support independent living and to enhance the active-senior lifestyle. Activities affiliated with the SUN Program include fitness classes, estate planning, lunch-and-learn seminars, off-site recreational outings, and more! The SUN Program helps our seniors involved with one another and encourages them to remain active, healthy, and educated! Shifting gears, Live. Learn. Relax. is similar to the SUN Program, but enhances the lives of college students. Live. Learn. Relax. is designed to create an unparalleled living experience for the average college student by immersing them in a fun, active, and academically supportive environment where there is no shortage of entertainment. Associated Live. Learn. Relax. activities include food drives, movie showings, professional speaker series, and trivia nights. We want our student residents to flourish academically and socially and our program helps support this mission. United Group loves getting involved with all kinds of volunteer events to raise awareness and make a difference. 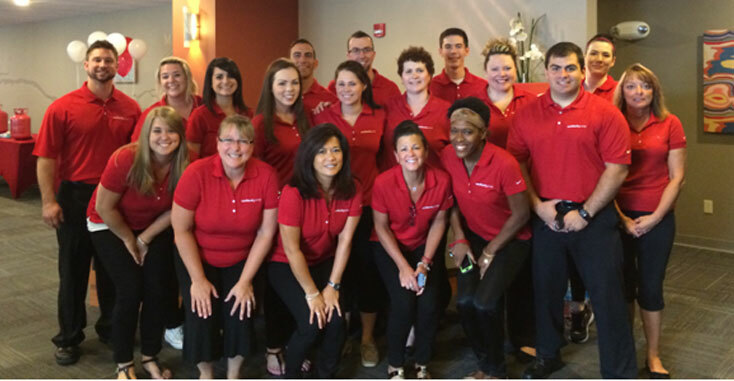 Each February, United employees “Go Red for Women,” a campaign initiative for the American Heart Association. During the holiday seasons, we participate in food and clothing drives, as well as the “Stuff-a-Stocking” event, where we assemble care packages for our troops overseas and local veterans. Other events have included Habitat for Humanity, the Salvation Army’s Adopt-a-Family, and Angel Tree programs. United Group plans to continue growing our philanthropic footprint throughout the local economy through various events and recognition efforts. Giving back is something we find imperative in order to show our thanks to everyone we cross paths with! United Group avidly cares about their employees and their education! Our current employees receive extensive training in programs and systems to ensure efficient and successful property management. Yes, training benefits United Group in the end result, but it benefits the employee engaging in the programs, as well to ensure quick and accurate usage – and it’s another skill they will have acquired to add to their growing resume! Aside from employee training, United Group encourages employees to further their education, sends employees to industry conferences around the country, and assists in obtaining real estate certifications. We want our employees to become more knowledgeable in their career field to not only better the company but to better themselves as well. College Suites at Plattsburgh works with members in the military and their military housing allowance. 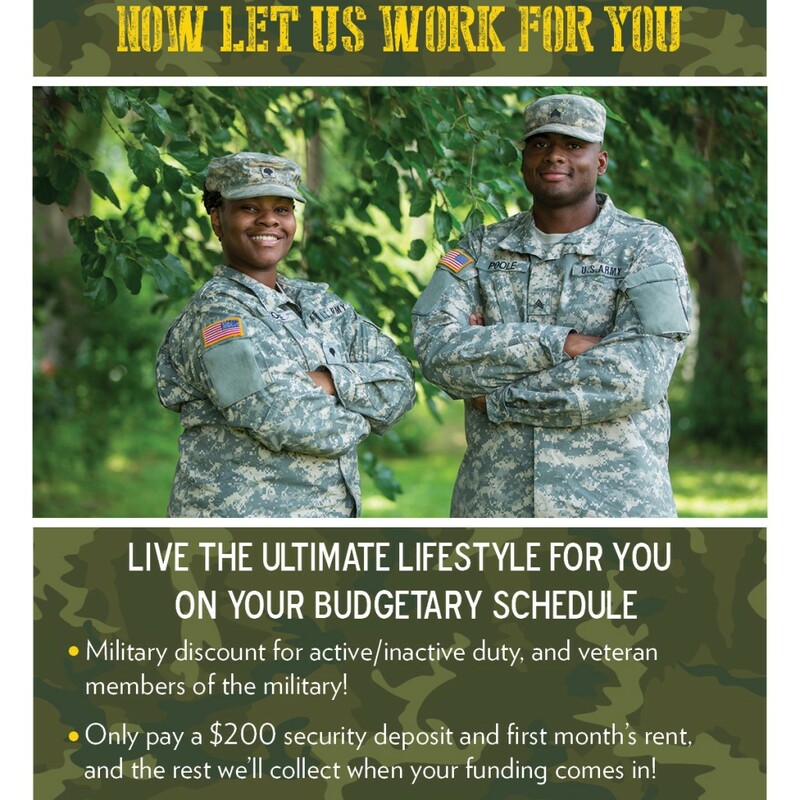 If you’re in the military and choose to live at College Suites at Plattsburgh, we want to help you – just as you help our country! 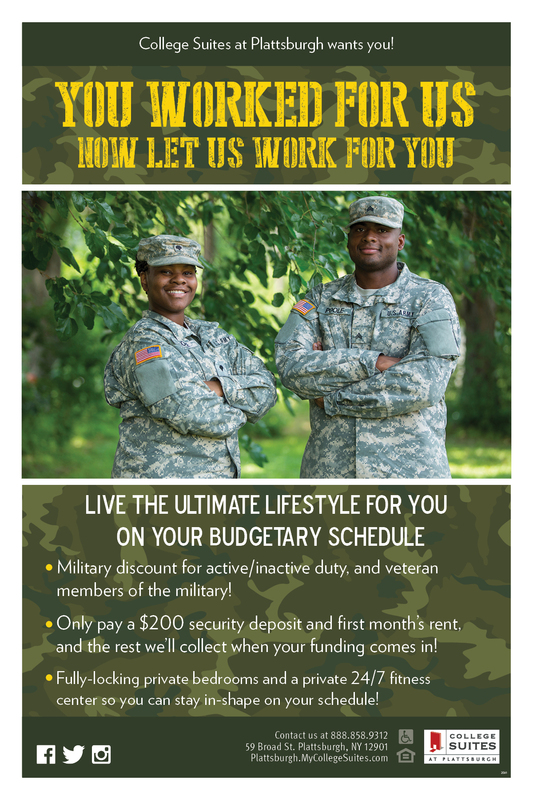 Military tenants pay a reduced security deposit and first month’s rent to support their budgetary schedule. The remaining rent will be on hold until your funding arrives! United Group thanks our military for serving. We love being inspired by other companies and becoming aware of what they care about. We hope to inspire our residents, properties, staff, and surrounding communities to pursue what they believe and to help others. As COO Jeff Arnold always states, “We are an others centered company” – we’re always looking for another way to make a difference and demonstrate that we care! Interested in learning more about United Group? Visit our website at www.ugoc.com.